First let's start with the obvious, the above mentioned Mini Tuna Balls. I have them stacked and packed inside the bottom compartment of this GoodByn Bynto and paired with a baby spinach salad. Inside the bunny container, also tucked in the bottom compartment, is Italian dressing. You might be wondering what a Mini Tuna Ball is - It's a delicious bite size snack or salad topper, made from three simple ingredients. That's it! Look for the recipe this week on the MOMables blog! Little Miss also has grapes and watermelon dices, with an elephant fork pick to eat them with. Also packed is a chocolate chip gluten-free muffin made with our King Arthur Flour GF Muffin Mix (KAF gluten free mixes are made in a top-8 allergen free facility). where's the recipe? I don't see it anywhere. It will be published this week - I'm guessing probably tomorrow :) Be sure to check back! I am intrigued by these tuna balls! :) Cute lunch as always! Super allergic to tuna myself, but the lunch is adorable. 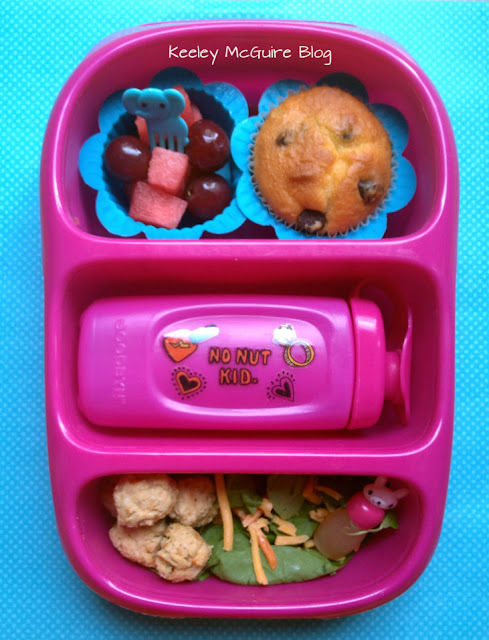 I love those little sauce containers and the muffins look yummy!